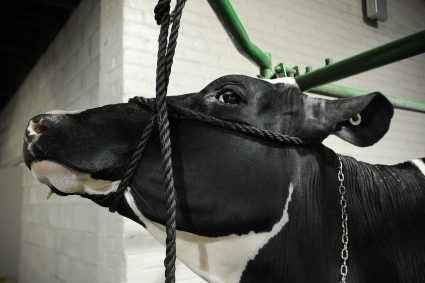 All cows in the dairy industry are forcibly and repeatedly artificially inseminated. This is because cows, like all mammals (humans included), only produce a constant supply of milk after giving birth. They produce their milk for the same reason all mothers do; to feed their young. Instead of this happening though, the cows' babies are removed and either slaughtered for veal (males) or raised to suffer the same fate as their mother (females). After just a handful of these repeated pregnancy/birth cycles, the cows' stressed body begins to struggle and milk production starts to slow, at which point she is sent to slaughter and used in low quality products such as ground beef or hamburgers. For a more in-depth look at these issues, please head over to the Taking Milk and Milking Cows pages.